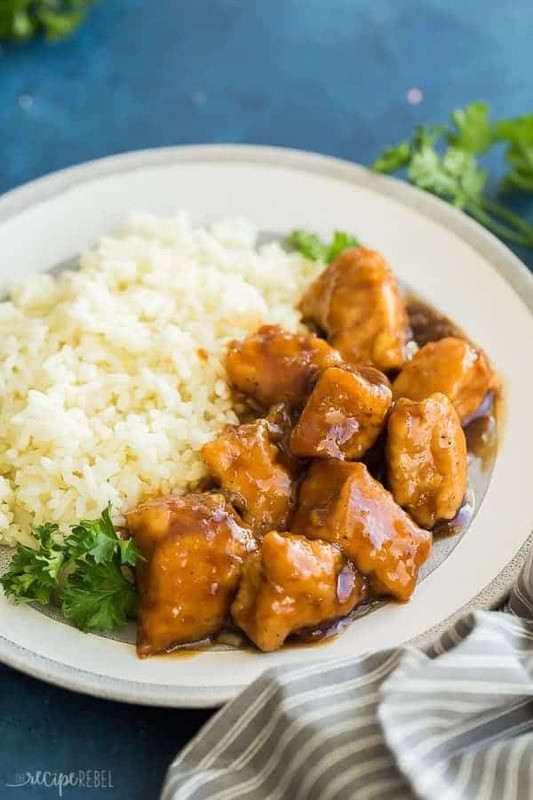 You are here: Home / Mains / Crockpot Orange Chicken recipe — better than takeout! 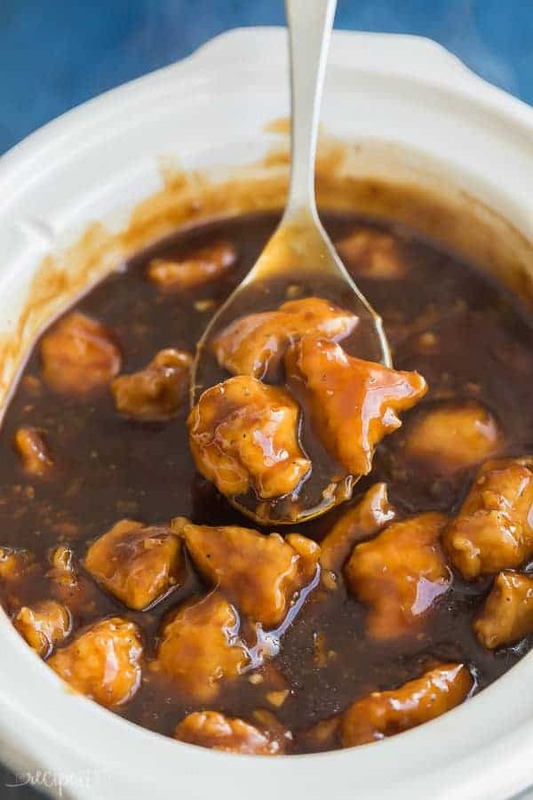 This Crockpot Orange Chicken is a healthier, homemade version of one of our favorite takeout meals! It has the most flavorful sauce! We are in that loooooong stretch of winter before spring comes, and I’m readying myself with all the easy, cozy crockpot meals. Since we live essentially in the middle of nowhere (we’re a few miles out of a town of about 500 people), we don’t have a lot of access to restaurants. Granted, there is a Subway across the highway from us, and a Chinese restaurant in the next town over about 10 minutes away, but when you grow up in the country (as a child, we lived even further from any small town than we do now), you just get used to not eating out. That being said, we do love our Asian food. And even though I am (obviously) not Asian, and I don’t really know what authentic Asian cuisine really is, this here is my interpretation. Because around here? This is what our Asian restaurants serve, and we love it! This Crockpot Orange Chicken is sticky, sweet, and tangy and perfect over rice with a side salad or veggies! I’ve included freezer directions and tips below — it’s a great recipe for stashing away for a crazy day! It’s pretty simple to make — the most labor intensive part is browning the chicken and you can skip that part if you need to! It’s great for making ahead. It’s pretty healthy, and definitely much healthier than what you would get at your favorite takeout joint! Crockpot meals make me feel like a champ when I’m not rushing around at 5:00pm to get dinner on the table. This recipe is naturally gluten-free, but be sure to double check all of your ingredients (especially the soy sauce!). This recipe is naturally dairy-free, but again, you’ll want to read your labels carefully. If you run out of time or are just plain lazy, you can skip the browning. The corn starch and browning just adds a bit of a crust like you would get at your usual “Asian” restaurants, without allllllll of that heavy breading. It’s the perfect compromise if you ask me! If you are browning your chicken, be sure to cut your chicken in equal sized pieces and not to overcook them in the pan so they don’t dry out. 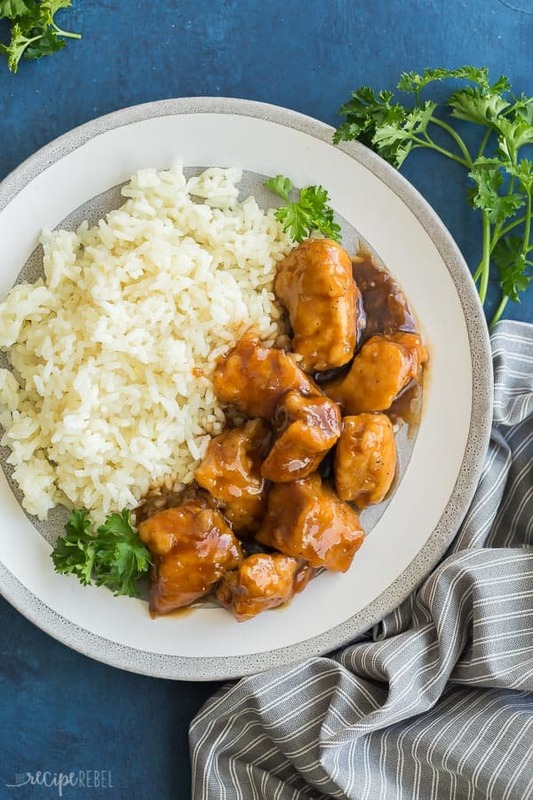 How to freeze this Crockpot Orange Chicken — two ways! This recipe makes a great freezer meal! To prepare ahead of time to cook in the slow cooker later, simply brown the chicken and let cool for 10-15 minutes. Whisk together your sauce ingredients and pour into a large freezer bag or container with your chicken. To cook, thaw and continue with the cooking process as listed. You can make a big batch for dinner and freeze half for another time if you prefer! Simple place the chicken with the sauce into a large freezer bag or container, and freeze for up to 3 months. In a medium bowl, combine 1/4 cup corn starch, salt and pepper. Add chicken and toss to coat. Meanwhile, in a medium bowl, whisk together marmalade, juice, soy sauce, broth, honey, remaining 1/4 cup corn starch, vinegar, garlic, ginger and red pepper flakes. When chicken is browned, add it to a 2.5-4 quart slow cooker and pour the sauce over top. Cover and cook on low for 2-3 hours, just until chicken is done and sauce has thickened. If sauce is too thin for your liking, combine an addition tablespoon of corn starch and water and add to the sauce before serving. This looks delicious! Can I make it with thighs instead of breasts? This was better than any takeout orange chicken I have ever had and I have had a many. It is extremely flavorful, sweet, tart, and ohhhh so good. I accompanied it with rice and steamed broccoli and the kids loved it as well. They are asking for it again already. It looks just like in the photos above and it is a winner for sure. Only variation was I added 2 pinches of red pepper flakes instead of one because we like a little more spice. Other than that I made it exactly like the recipe. Thanks Cheryl! I’m so happy to hear that it turned out well and everyone enjoyed it! In the crockpot as I type this! Is it really 2-3 hours on low to cook? I’ve seen several recipes where it’s the same amount of time but on high. I’m trying freshly squeezed oj and cut up several oranges to put in the sauce, instead of using marmalade. I once went to a restaurant that had fresh oranges in their orange chicken and it totally blew my mind. Thank you for the recipe!! Yes! Small pieces of chicken cook very quickly in the slow cooker. I hope you enjoy it! I don’t see what is in this recipe to make the sodium level so high. Unfortunately the nutrition information calculated by the recipe card is not always 100% — I’ve found that the sodium is often unnecessarily high! I would recommend plugging the recipe into your own calculator if sodium is a concern to you.